Willemsparkweg 126 hs AMSTERDAM, Oud-Zuid Vondelpark - Peter Bruin Makelaardij o.g. b.v.
WIILEMSPARKWEG 126-HS , 1071 HP AMSTERDAM. 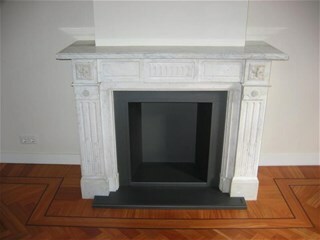 Beautiful renovated, un-furnished ground floor apartment of approx. 240m2 divided over three floors with 6 bedrooms, two full bathrooms and garden in the rear, located at the popular Old South of Amsterdam. 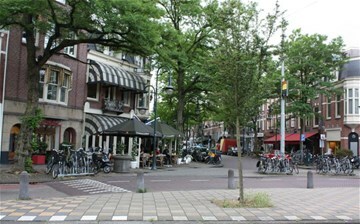 Within walking distance of exclusive shops and boutiques in the Cornelis Schuystraat as well as the P.C. Hooftstraat, Vondelpark and excellent public transport facilities. Bel-etage: Private entrance with hall and separate toilet. Spacious living room with high ornamented ceiling, fishbone parquet floors throughout and beautiful fireplace. En-suite sliding doors towards dining room, with modern fully equipped open kitchen and access to terrace and landscaped garden. Lower ground floor: Large bedroom with fitted wardrobes and access to the garden. Modern bathroom with bath and separate shower, washbasin and toilet. Two good sized bedrooms and an utility room with washer and dryer. 1st floor: Master bedroom with access to terrace. 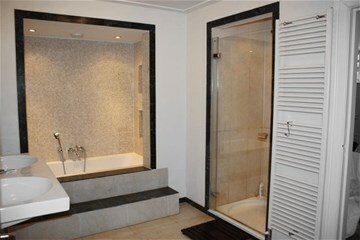 Luxurious bathroom with bath and shower, washbasin, separate toilet and another two good sized bedrooms. Excellent family house in beautiful residential area of Amsterdam.